Black Moth Super Rainbow, Birds of Avalon, Hopewell, and Menomena added – Bob Mould now performing with No Age. All rooms at Kutsher’s are now sold out. A limited number of rooms are still available at the nearby Raleigh Resort. All Tomorrow’s Parties (ATP) is happy to announce its return to Kutsher’s Country Club in Monticello, New York for the 2nd annual ATP New York festival. The event will be held Sept 11-13, 2009. Expect more of the same greatness in 2009, with no-holds-barred programming both musically and otherwise. Capacity limited to just 2800 people! All stages are INDOORS so rain will not be an issue! Last year’s festival, co-curated by My Bloody Valentine, was a critical and cultural success with rave reviews from media and fans. This year’s Fest will be co-curated by The Flaming Lips. Friday will feature the first New York show in a long time by The Jesus Lizard and ATP favourites Iron and Wine. Panda Bear will also have exclusive performance on Friday. Please note this was initially scheduled for Saturday, and Saturday ticket holders will have the option to switch to Friday if they so choose. They will join the Don’t Look Back shows also taking place on Friday: The Feelies performing Crazy Rhythms, New York’s finest Suicide performing their first LP, Dirty Three performing Ocean Songs and The Drones performing Wait Long By The River… The evening will be rounded off with the Comedy Stage hosted and curated by the one and only David Cross. Eugene Mirman, Jon Glaser and Jon Benjamin (The Fuggedabuddies), and Derrick Brown and the Navy Gravy will all be performing on the comedy stage. Saturday is curated by ATP will feature performances by Sufjan Stevens, Animal Collective, Shellac, Circulatory System, and Grouper. Other confirmed acts include Boss Hog, Deerhunter, Bridezilla, Melvins, Black Dice, Dead Meadow, Autolux, EL-P, Akron Family, Antipop Consortium, Atlas Sound and the hotly tipped Sleepy Sun. 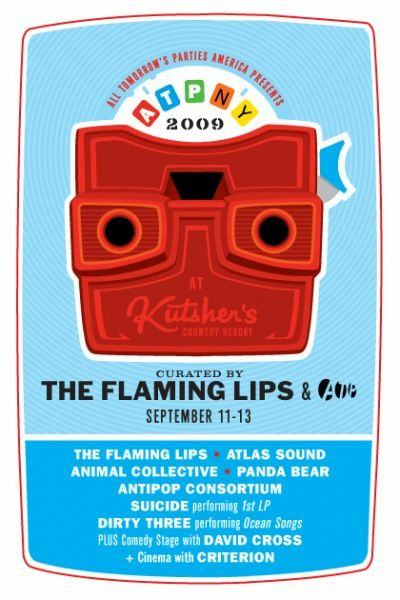 Sunday is curated by the outlandish Flaming Lips. Every act that plays will perform an exclusive special show, bespoke for this event. New additions to Sunday’s lineup are Hopewell, Black Moth Super Rainbow, Birds of Avalon, and Menomena. Also performing special sets – Crystal Castles, Super Furry Animals, Boris, and Low Lows. Previously announced acts include: “Oneida presents the Ocropolis” – where Oneida will transport the impetus, spirit and community of their multidisciplinary studio/performance space, The Ocropolis, to ATP. Boredoms continuing their BOADRUM series, performing with 9 drummers on stage. No Age will perform a whole LP by Husker Du with (JUST ANNOUNCED) special guest Bob Mould. Deerhoof will perform with special visuals by Martha Colburn. Caribou will perform as Caribou Vibration Ensemble, with a 4 piece horn section, 4 drummers and a choir and guests that include Kieran Hebden (Four Tet/Fridge/Kieran Hebden & Steve Reid), Koushik (Stones Throw Records), John Schmersal (Enon, Brainiac), Kathryn Bint (One Little Plane), Ahmed Gallab (Sinkane), Marshall Allen (Sun Ra Arkestra) and more. The cinema for the weekend is hosted by Criterion. *moved from Saturday. Saturday ticket holders will have the option to switch to Friday if they choose. No Age featuring Bob Mould performing songs of Husker Du. This entry was posted on August 14, 2009 at 7:28 am and is filed under atp festival, chicks with guns, On tour. You can follow any responses to this entry through the RSS 2.0 feed. You can leave a response, or trackback from your own site.